Leonid Rogozov was a Soviet general practitioner who took part in the sixth Soviet Antarctic Expedition in 1960–1961. 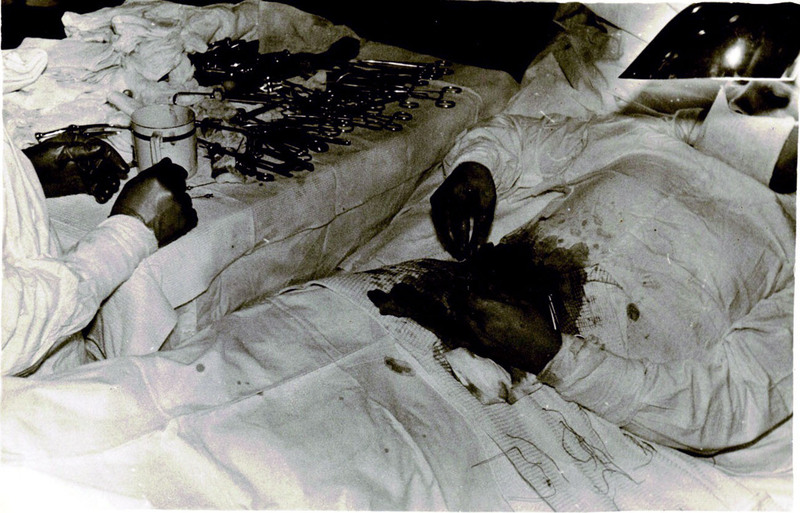 He was the only doctor stationed at the Novolazarevskaya Station and, while there, developed appendicitis, which meant he had to perform an appendectomy on himself, a famous case of self-surgery. “It seems that I have appendicitis. I am keeping quiet about it, even smiling. Why frighten my friends? Who could be of help? A polar explorer’s only encounter with medicine is likely to have been in a dentist’s chair”. 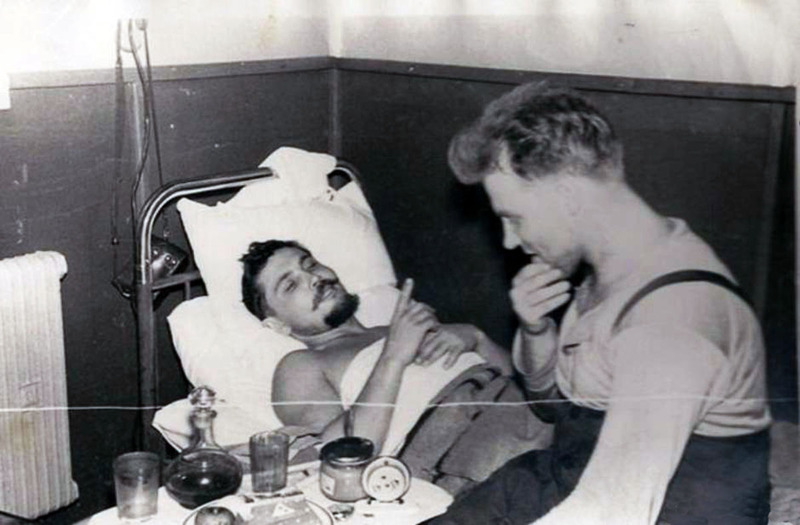 Leonid Rogozov lying down talking to his friend Yuri Vereschagin at Novolazarevskaya. All the available conservative treatment was applied (antibiotics, local cooling), but the patient’s general condition was getting worse: his body temperature rose, vomiting became more frequent. “I did not sleep at all last night. It hurts like the devil! A snowstorm whipping through my soul, wailing like a hundred jackals. Still no obvious symptoms that perforation is imminent, but an oppressive feeling of foreboding hangs over me… This is it… I have to think through the only possible way out: to operate on myself…It’s almost impossible…but I can’t just fold my arms and give up”. 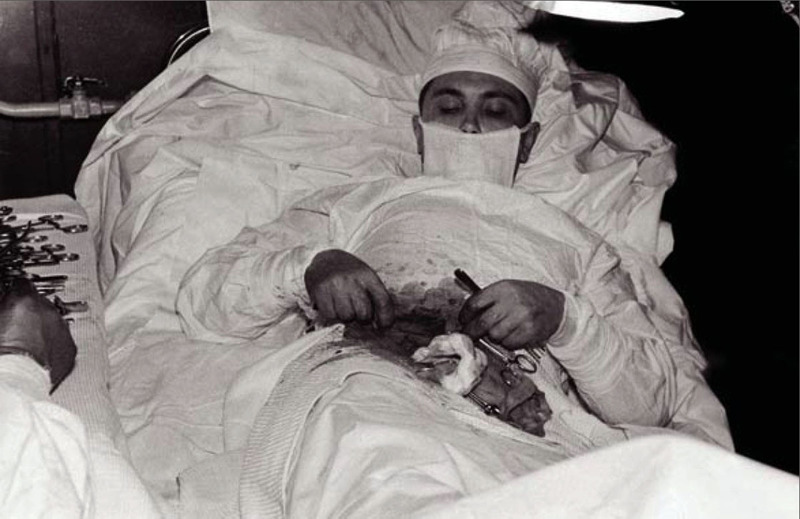 Rogozov had no option but to perform the operation on himself. The operation started at 02:00 local time on the first day of May with the help of a driver and meteorologist, who were providing instruments and holding a mirror to observe areas not directly visible, while Rogozov was in a semi-reclining position, half-turned to his left side. After 30-40 minutes Rogozov started to take short breaks because of general weakness and vertigo. Finally he removed the severely affected appendix. He applied antibiotics in the peritoneal cavity and closed the wound. The operation itself lasted an hour and 45 minutes. Partway through, the helping team took photographs of the operation. The operation itself lasted an hour and 45 minutes. “I worked without gloves. It was hard to see. The mirror helps, but it also hinders—after all, it’s showing things backwards. I work mainly by touch. The bleeding is quite heavy, but I take my time—I try to work surely. Opening the peritoneum, I injured the blind gut and had to sew it up. Suddenly it flashed through my mind: there are more injuries here and I didn’t notice them… I grow weaker and weaker, my head starts to spin. Every 4-5 minutes I rest for 20-25 seconds. Finally, here it is, the cursed appendage! With horror I notice the dark stain at its base. That means just a day longer and it would have burst and… At the worst moment of removing the appendix I flagged: my heart seized up and noticeably slowed; my hands felt like rubber. Well, I thought, it’s going to end badly. And all that was left was removing the appendix… And then I realized that, basically, I was already saved”. After the operation gradual improvement occurred in the signs of peritonitis and in the general condition of Rogozov. Body temperature returned to normal after five days, and the stitches were removed seven days after the operation. He resumed his regular duties in about two weeks.The self-surgery captured the imagination of the Soviet public at the time. In 1961 he was awarded Order of the Red Banner of Labour. Leonid Rogozov a few years after his return to Russia. 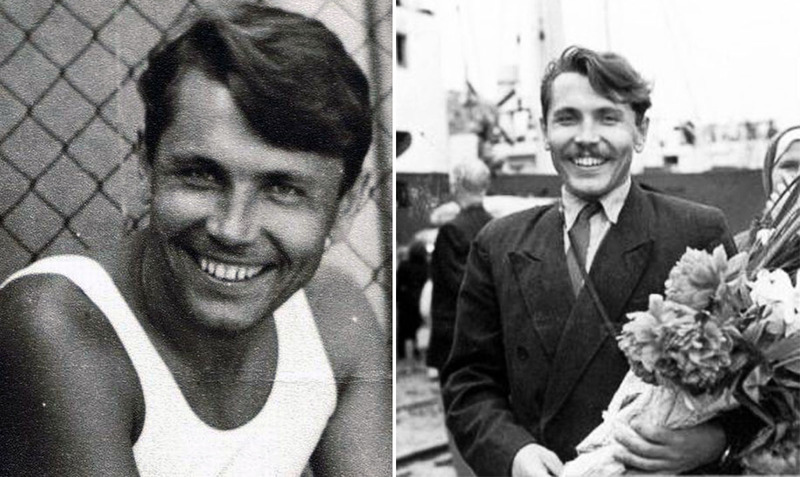 Rogozov’s self operation remains an example of determination and the human will for life. In later years Rogozov himself rejected all glorification of his deed. When thoughts like these were put to him, he usually answered with a smile and the words: “A job like any other, a life like any other”. In October 1962 Rogozov returned to Leningrad and started working on an MD at his alma mater. In September 1966 he defended an MD thesis titled “Resection of the esophagus for treating esophageal cancer”. He later worked as a doctor in various hospitals in Saint Petersburg. From 1986 to 2000 he served as the head of the surgery department of Saint Petersburg Research Institute for Tubercular Pulmonology. Rogozov died in 2000, aged 66, in Saint Petersburg, Russia, from lung cancer. This story is amazing! This man is a myth! Wow! I can't imagine how utterly frightening that must have been! He would be considerd a hero in my eyes! This is evidence that nothing call kill somebody, except God Almighty Himself. He even rejected d glory ascribed to him. What a hero!!. Love you. This heroic story worth to be put in a good movie!